This is part 2 in a 12 part series….read part 1 here. 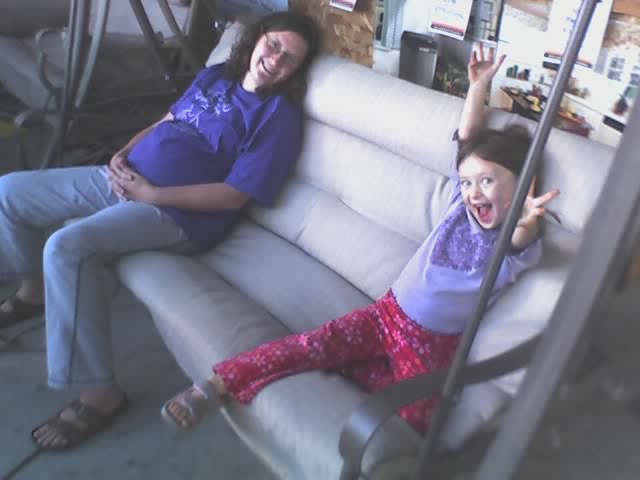 Chillin in front of a local hardware store, about 7mos pregnant, with my 4.5yr old. 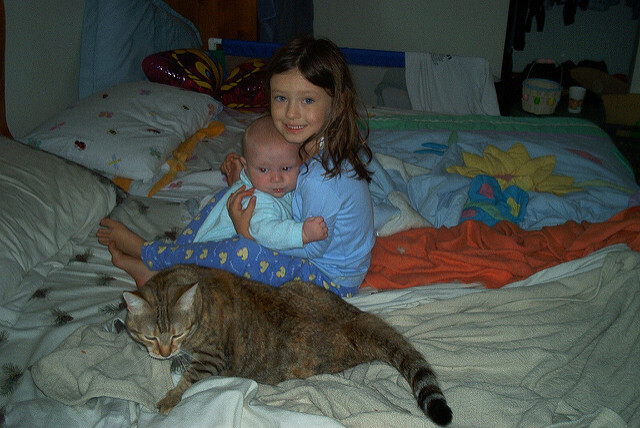 The year was 2005…the beginning of the year…My oldest was 4 and a half. I was pregnant with our third. (We lost a son to full term stillbirth in between my oldest and youngest. So this pregnancy was my 3rd full term, but was my 2nd, and last, living child.) I was starting to get really excited about “doing kindergarten” with my daughter. I had purchased a curriculum, Enki (no longer exists as a homeschool curriculum…it was an extremely expensive and way overly complex hybrid Waldorf-like curriculum that never worked out for me…far too teacher intensive… so I wasted $500 on it) and was stressing over the upcoming year…trying to figure out how to balance a new baby and teaching my kindergartner in the quickly approaching school year. Didn’t happen, I finally realized I needed to push kindergarten off another year for when the baby was older. Thank heavens my daughter was a November baby so I could easily do that, and that I finally realized that I should do that. I can’t imagine HOW that first year with my new son AND figuring out what I wanted to do for homeschooling would have gone if I had persevered! PHEW! My youngest was born in July 2005, when my daughter was 4yrs 8mos old. So far so good…she loved her baby brother! So once the reality of having a newborn and adjusting to 2 children set in, I happily pushed off her kindergarten year from fall of 2005 to fall of 2006. And I thought, oh that will give me a whole year to figure out the Enki curriculum! But did I? NOPE! It was too much for me. I finally gave up. It was just not the right thing for us. I settled into parenting 2 kids, and parenting a newborn again. We’d just keep living our life and enjoying each other and the academics could wait. I do think I continued to make sure that our home was as enriching an environment as possible. 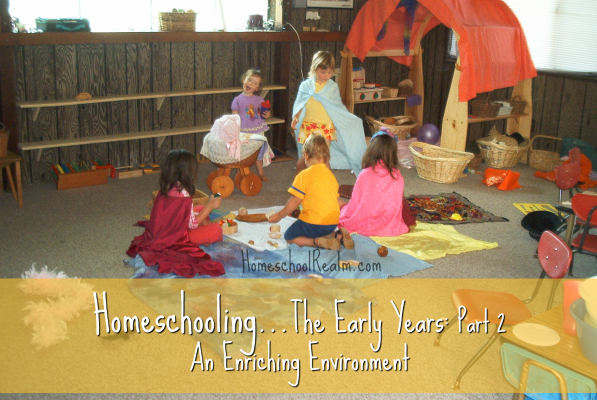 It already was…I am a former preschool teacher, so our home was always an enriching environment. Click on the images to make them bigger and check out the shelves behind my daughter. Those are preschool tables…the laminated, easy to clean up kind. I got them from the preschool I used to work at when they went out of business. You can find similar at Discount School Supply. Well worth the money. They last forever and are super easy to clean up! The play areas of my house changed a lot over the years, but they were always in the areas that we were the most comfortable and spent the most time. Our playroom, for a number of years (until we divided it into 2 rooms when my youngest was about preschool age) was our garage conversion…a massive, sunny, wonderful room that we loved spending time in. In the 2nd picture in the gallery above you can see that I even converted our fireplace into a playhouse, using a cardboard box. (Click on the image to enlarge to see.) In that same picture you can also see the reading area in the back corner of the room…with the big pillow on the back of the couch, where we sat on the floor together to read the books in that face-out bookshelf. The boys in that pic are visiting friends. Imaginative play things: Dress up clothes like capes, belts, feather boas, necklaces, hats, tails, ears, etc…silks that could be anything…pretend play toys like dolls, animals, toy (and real) kitchen things (many thrift store and dollar store finds! ), tools, baskets of assorted loose things that could be anything they imagined them to be like juice lids and pom poms…and a play house area (Waldorf playstands my dad made). 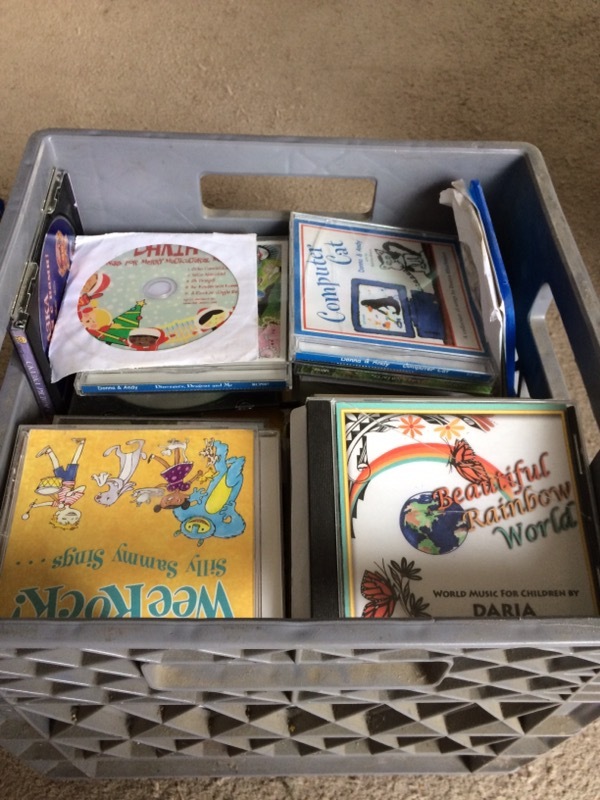 Crate full of all my children’s cds I have collected over the years. And outside….swings and hammock and sand pit and tricycles and sidewalk chalk and bubbles and water table and outside toys..
AND SOCIALLY?? I’m an extrovert so I was always very active socially with mommy groups, even organizing and planning lots of groups and activities myself, since my first child was born. So homeschooling really didn’t change things at all for me in that regard. This is just #2 in a 12 part series…I will share more with you each day…including pics and videos of all sorts of things that we did for my kids’ early years! The hope is to show you that these early years can and should be fun and playful. And they don’t have to be a lot of work for you!